Business-analytics vendor Tableau Software moved to stake out its turf now that Microsoft has entered the business intelligence (BI) market, criticizing the newcomer in what it says are "10 ways Power BI Falls Short." Tableau Chief Product Officer Francois Ajenstat said yesterday the aim is to "educate" IT and procurement executives who aren't necessarily end users of BI software but control an organization's BI budget. "Microsoft has a lot of [market] presence, and as a result people ask," Ajenstat said. "They want to know, 'What's the difference?'" In other words: Why pay $999 or more for a Tableau desktop license when Power BI is available for free? Tableau's criticisms of Power BI include limiting visualizations to 3,500 data points, difficulty in calculating what-if scenarios and inability to customize pop-up boxes (although Power BI does allow adding extra categories in a tool tip). Ultimately, Tableau officials believe their software is significantly better at helping people analyze, not merely visualize, data. Not surprisingly, Microsoft vehemently disagrees with Tableau's critique. "If you compare any two products, you will always find some capabilities that one product has, and the other is lacking," Amir Netz, Technical Fellow and Chief Architect of Microsoft Business Intelligence, said via email. "That said, I was really encouraged when I saw Tableau's list of differentiators. Tableau had to dig very deep in order to find some differentiators. What they are showing are not really features, but selective differences in the behavior of some features. "And even with that list -- a few of these gaps have been closed, and many others are in the works." This is an interesting time for BI software. Microsoft has moved into the market in a big way since the general launch of Power BI last summer; Google recently announced a free version of its Data Studio BI tool; and long-time specialists such as Tableau and Qlik released new, upgraded versions of their software. Add to that the increasing popularity of R, a computer language designed for statistical analysis that can be run with both Power BI and Tableau -- and there's a lot more capability now for those seeking to analyze data than there was a year or two ago. When looking specifically at Tableau vs. Power BI to see which makes sense for what types of users, a good starting point might be that Tableau is a more obvious choice for higher-end analysis while Power BI makes sense for creating better graphics when sharing reports (especially in an organization that's already a Microsoft shop). But even if both vendors would agree, that still leaves a large and lucrative in-between market of business end users seeking so-called self-service BI to find insights in data. "Just creating a picture, anybody can do that. For us the picture is the means of communicating the data and a way of asking questions of the data," Ajenstat said. 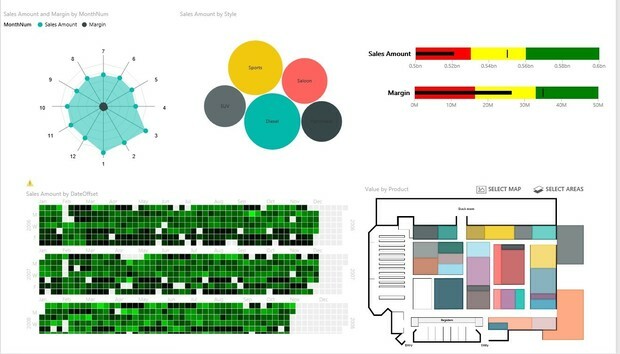 The Power BI motto, meanwhile, also emphasizes ease-of-use and speed: "Five minutes to wow." It's difficult to add narratives to dashboards in order to "tell a story"
Dashboards that collect important visualizations from reports into what Netz called a "higher-level view"
A data model that supports large numbers of tables and more complex relationships between tables. "Tableau does not support more than trivial data models," according to Microsoft's emailed response. Ultimately, though, Ajenstat doesn't believe the friction between Tableau and Power BI will affect Tableau's larger partnerships with Microsoft outside of the Power BI platform. Tableau "integrates deeply with Azure," Ajenstat noted, and was part of the SQL Server 2016 launch. And, of course, data in Excel can be pulled into Tableau. The "list of places where we're working together is dramatically bigger than places where we overlap," he said. "We live in this world of 'co-opition.' ...For a customer, that just means choice. " As platforms race to out-perform their competitors, those choices should continue to get more robust.